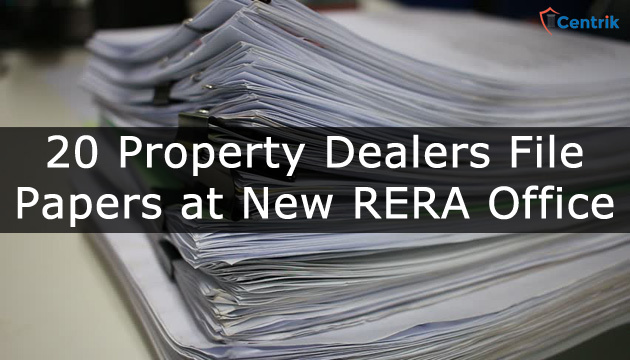 HRERA: The new office of Haryana Real Estate Regulatory Authority (HRERA) received 20 applications from those looking for registration as property dealer in two days after the beginning of operations on Tuesday. Dr KK Khandelwal , Chairman of HRERA said that registrations and complaints were not being filed in the correct format but the office had not dismissed any. He further said that the applicants were being informed in regards to the procedure to follow for getting registered as property dealers. A standard format has been prepared which has been uploaded on the website. Khandelwal informed that the registrations would be granted, subject to certain conditions. The real estate agent should ideally not facilitate the sale or purchase of any apartment, plot or building in a real estate project or any part of it being sold by the promoter when it is not registered with the authority. The real estate agent additionally ought not to involve himself in any unfair trade practices and provide documents and information to which the allottee is entitled at the time of booking of any apartment, plot or building. Khandelwal, adding that applicants can register as an individual by paying Rs 25,000 or as a firm/company by paying Rs 2,50,000 said that a fee has been prescribed which is to be submitted in the form of cheque or demand draft. He said the firms and individuals were required to furnish contact details, address proof, pan card, along with photograph. After examining, the applicant will be informed within a week about issues with the application. The final decision about the registration will be taken within 30 days, after the issues are taken care of.